Charlson Joseph, a graduate intern in the Educational Opportunities Program (EOP), understands iffy neighborhoods and growing up without much money. He understands being a child of immigrants with high expectations. And he understands the challenges EOP students face between the day they step onto a college campus and the day they graduate. 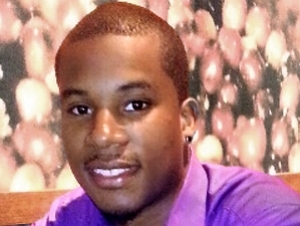 Joseph came to Buffalo State as an EOP student from Brooklyn, New York, in 2008. Education was always a top priority for his parents, immigrants from Haiti. Although resources were limited, their emotional support was not and they encouraged him to apply to Buffalo State to study science and early childhood education. Although he later transferred to the University at Buffalo because he decided to major in allied health, he returned to Buffalo State as a graduate student in the Higher Education Administration Department. With aspirations of working in student affairs, he is on track to earn his master’s degree in May. For the past two semesters, Joseph has mentored students through the college’s Sophomore Success Program, which helps with Buffalo State's retention efforts. As a mentor, he has helped approximately 40 students develop study skills, learn how to talk to their professors if they are struggling, and connect to jobs and research opportunities on campus. Jude Jayatilleke, EOP senior academic adviser, said it’s invaluable to have a student such as Charlson as a mentor. “The students look up to him and connect with him in ways that they don’t with regular staff,” said Jayatilleke. Joseph wouldn’t be in this leadership position without the Graduate Educational Opportunity Program (GEOP), which covers tuition for graduate students who are former EOP recipients, as well as the Jaelah Yannis Jenkins Fund. The latter, funded through donations to the annual Faculty and Staff Appeal, allowed Joseph to participate in professional development activities, such as the National Association of Student Personnel Administrators (NASPA) Conference held in March in Indianapolis, Indiana. He said he made important contacts in the field and landed a job interview. It also assisted with travel and vaccination costs to a study trip to Ghana during the winter break. Established in 2005 as the EOP Program Fund, the fund was renamed in 2009 in memory of EOP Director Yanick Jenkins’s daughter, Jaelah. Assisting with course supplies, conference travel, and anything else that supports students academically, the "Jaelah Fund" is one of six EOP funds included within the appeal. Joseph is grateful for the assistance he’s received. “I wouldn’t have been able to afford graduate school otherwise,” he said, adding that he would like to see more EOP students pursue a graduate degree. First, they have to finish their undergraduate degrees. When he sees students wavering, he tells them to stick with it. To contribute to an EOP fund or any of the scholarships included within the 2016 Faculty and Staff Appeal, contact Mario Hicks at (716) 878-3467.